This is just a very small snippet of things that I hear people say. There are a whole host of reasons people leave the Catholic Church. Some of them are due to lack of knowledge and understanding of the faith and the Church. Others experienced negativity or have been hurt by members of the Church. Some individuals may feel let down, ignored, or just plain disinterested. According to the Catholic News Agency, a recent study by St. Mary’s Press and the Center for Applied Research in the Apostolate at Georgetown University (CARA) revealed that the median age when people leave the church today in 13. Yes, you read that right, 13 — and some leave as young as 10! That statistic shocks and saddens me to the core. It is alarming and it should be alarming to every Catholic parent who hopes and prays that they are effectively passing on the faith to their children. Kids are starting to question their faith at a very early age. This isn’t necessarily a bad thing as long as they come to us for answers and we (the parents, godparents, grandparents, and teachers) know how to answer their questions or show them where to find the answers when questions and doubts arise. The other thing the study revealed, is that many of those surveyed never expressed their doubts or questions to their parents. That means kids could be making these decisions without even giving parents the opportunity to help answer, or find the answers to the questions they have. Another thing that jumped out at me, was that 87% of those surveyed said their departure from the church is final! Of course, no one really knows what the future holds but what this tells me is that we can’t just count on them coming back once they get married and have children like we have in the past – we have to reach them while they are young! We may not get a second chance. CARA researchers identified patterns among the young people’s personal stories and described three archetypes for their Catholic disaffiliation: the injured, the drifter, and the dissenter. The Injured, would be a person who felt that God abandoned them or did not hear their prayer during an incredibly difficult time. This person may have also suffered a trauma or tragedy and wonders where God was in all of that. The Drifter, doesn’t really see the point or find value in their Catholic faith. Maybe they went to church but faith was not really interwoven into other aspects of their day-to-day life. This can also be a person who does ask questions or expresses doubts but gets shut down or told they must not have a strong faith – so they just drift away. The Dissenter, is someone who disagrees with Church teaching, whether real or perceived, and cuts ties because of that. For one thing, I think it lets us know just how great the impact of our “domestic churches” have on passing on the faith – or failing to do so. The foundation of faith starts in the home. While growing up in a faith-filled family who is consistently living out their faith is no guarantee, it certainly does increase the chances of those seeds of knowledge taking root. So as parents, my husband and I want to do all we can to ensure that our kids not only stay Catholic but understand why they are Catholic and have the ability to articulate that to others. Today, I am going to share some of the things we are doing to try to keep our children Catholic. This in not a definitive list and we do different activities as they grow or I come across new resources. I won’t go into too much detail about these, but plan to in future posts. At that time I will share tips and the resources that we have found helpful along the way. Evangelize Ourselves First // It is said time and time again that you cannot pour from an empty cup. You cannot give what you don’t have. If I do not really know why I am Catholic and have a good understanding of my faith then it will be exceedingly difficult to pass that on to my children. While I am no theological expert and have a TON to learn, I do spend a lot of time and energy studying scripture, the Church’s teachings, why Catholics believe what we believe, what the early Church Fathers taught, and what the most common objections and misconceptions of the Catholic faith are. This is helpful because when my children have questions, I either know how to answer them, or where to go to find those answers. Make Mass a Priority // We attend Mass every Sunday. While regular Mass attendance isn’t a guarantee that our kids will stay Catholic, it does help. Going to Mass is only part of it – understanding what happens during Mass and why it is important is the other critical part. There is so much to say about ALL that goes on during the Mass and why going is important but I think that deserves its own post. For now, I am going to leave you with this great explanation from Fr. Mike. We Serve within Our Parish // There are some Sunday’s when my entire family is serving at Mass (an absolute dream come true for me!). I am a Lector, my husband is an Extraordinary Minister, our older boys are Alter Servers and our littlest can often be seen assisting the ushers or holding the basket for the children’s collection. This is not unique to my family though. We have several families within our parish that all serve together. My husband is an active member of the Knights of Columbus, I co-lead a Catholic women’s bible study, our children go to our parish school and we volunteer there in many capacities. We do these things because it feels good to be part of a community. Working together to bring the light of Christ to others in our parish and beyond. None of us is perfect. We all have our joys and our struggles but knowing we are all pitching in to help the ministries within our parish succeed and reach those who need them most, is a fulfilling experience. We Pray Together // We are not the perfect prayer family. We pray before dinner, we pray before bed, my boys and I pray together as I drive them to school, and we try to pray the Rosary as a family every Sunday night. Sometimes we like to do devotions together during dinner. It is a good way to get conversations about life and faith started. Could we pray together more? Absolutely, but it seems with each passing year our prayer life grows and I am grateful for that. One of my very favorite shows on EWTN right now is called Praying as a Family. I have been so encouraged and inspired by the many stories that the families share on this program. As they say, the family that prays together, stays together and I really think is most cases this is quite true! We Explain Why We Believe What We Believe // I never want to hear my children say that they don’t know why they are Catholic, or that they were just raised Catholic and that is why they are. Those are things I said. Thankfully, a firm foundation was laid for me early on. Though I teetered on the edge of leaving the faith – I just could not do it. Though the grace of God, my roots stayed firmly planted in place. You can read more about my story if you like. I know the questions my children have circling through their minds, I know the temptations they will face, I know that doubting and questioning is something we ALL contend with at different times in our lives. So we face it head on. We encourage them to ask questions and when we don’t know the answer, we don’t make it up – we find a trusted Catholic resource to help us. 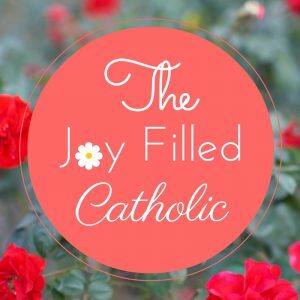 Our Home is Filled with Sacramentals and Holy Reminders // I once heard Catholic Apologist, Patrick Madrid say, “Sacramentals are a reminder of who we are and whose we are.” That is so true! We have a Crucifix in nearly every room of our home. We have our Rosary wall and a beautiful statue of Mary with baby Jesus cradled in her arms. In our living room is a statue of Jesus, our Good Shepherd. I wear two Miraculous Medals (one given to me by my Grandparents for my First Communion and one that my Mom gave me a few years ago) with a cross my husband gave me. We are surrounded with all sorts of reminders of , who we belong to. When people enter our home, they are reminded of this too. One of the first things we see when we enter our home is a quote that says, “As for me and my house, we shall serve the Lord.” Joshua 24:15 That pretty much sums up our goal as a family – to serve the Lord! Previous Post What if Our Children Leave the Church? How awesome that your entire family was serving at Mass! My own take is that there are a couple of things that lead to exit. First, people want to be entertained. To me, this is incredibly sad. I am so enamored with the Eucharistic preface when the priest proclaims, “It is truly right and just, our duty and our salvation, always and everywhere to give you thanks, Lord, holy Father, almighty and eternal God.” To seek to be entertained is part and parcel to the claim, “I don’t get anything out of it.” Well, it’s not about ME. Right. Just. Duty. Salvation. Always. Everywhere. Thanks be to God! The second thing I see is that many, all to often, hear the teachings of the Church as dictatorial and rule oriented and they see us who proclaim to be true followers of the one, holy and apostolic Church as frauds who don’t live that way outside the walls of our parish. And that’s on me and all of us. We need to live our faith, not just proclaim it with our creed. OK, sorry — I seem to be writing a new blog post! But this is an important topic for me, someone with adult children struggling with staying in the Church themselves. Thanks Christie for the post. Great stuff! I have a hard time because we have family who aren’t Catholic, are not fans of going to Mass, and suggest our services are stuffy – which compared to their non-denominational services I’m sure it does feel that way. Honestly, I was really bored at Mass for a long time but when my husband went through RCIA I realized why. I didn’t understand what was going on. I understood a little but I didn’t really grasp the sacredness. With my schooling and Catholic upbringing I should have – but it was lost on me until my husband brought home a video that described each part of the Mass and what is taking place. It changed everything! EVERYTHING! Like, I could not and still can not get enough of learning about scripture and the Church. I also agree with you about more of us needing to live out our faith in our day-to-day. It’s not always easy to live our faith boldly knowing that we are made fun of behind our backs by family members for our devotion – but as you pointed out, it’s not about us – we are striving to do the Lord’s will and if that makes us look like some “holy oddballs” well so be it 🙂 However, if we watered down, or tempered the way we live our faith (which sometimes we do unintentionally) then we do look like hypocrites. If I am going to proclaim it, I am going to live it. That’s what I want our children to see and know as well. I’ll look forward to your blog post! Thanks for stopping by and sharing your thoughts. Always so insightful and appreciated. Bring on the Holy Oddballs!! This is such an important topic. I have 8 kids, soon to be 9. We came into the Church as converts at Easter 2016, all of us…but by September, we discovered that my oldest, who was 17 at the time, now considered herself an atheist. It was very difficult as before we were Catholic we were devout Presbyterians for her whole life, and integrated the faith into our family life on a daily basis from her birth. It nearly broke us as parents – feeling like we had done our best with what we had, and failed. Now, two years later, we have a good relationship but she maintains her status as an atheist. I’m afraid for the rest of the kids, TBH. I don’t really know if there is anything we could have done differently, though I always wonder, what if we had been Catholic from the beginning? Would it have helped? And will our current practices, which are pretty much what you said, above, help the younger ones? Hi Desiree! Thank you so much for stopping by to read and add your insight to this important topic. First of all, congratulations on baby #9! What a blessing. I do have a few resources that might be helpful for you and your oldest. The book “Answering Atheism” by Trent Horn is good. You could both read that. Also, Catholic Answers has a ton of archived podcasts that Trent has done where he asks callers “Why are you an atheist?” Callers pose their objections to him and he provides a charitable Catholic Answer. Also, Trent just did a debate with Dan Barker entitled “Does the Christian God Exist?” You can find a link on his FB page https://www.facebook.com/TrentHornCatholicApologist/ Another person I recommend is Dr. William Lane Craig. He is not Catholic but is an Evangelical Protestant and a brilliant Christian philosopher. He has done a lot of debates with atheists about the existence of God. You can find those on YouTube and you can check out his website Reasonable Faith. I will be praying for you and your family ❤ God bless! What if Our Children Leave the Church?